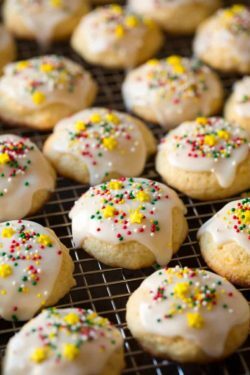 A melt-in-your-mouth, flavorful, cake-like cookie that’s topped with a sweet and simple lemon cream cheese glaze. Easy to make and even easier to eat and fall in love! In a large mixing bowl whisk together flour, baking powder, baking soda and salt, set aside. In the bowl of an electric stand mixer fitted with the paddle attachment cream together butter and sugar until slightly fluffy. Blend in eggs one at a time. Mix in sour cream, lemon zest and vanilla. Add flour mixture and mix until combined. Cover bowl and chill dough in refrigerator until dough is a little more firm and easier to work with, about 1 hour (it will still be fairly sticky). Preheat oven to 375 during last 10 minutes of dough chilling. Line two 18 by 13-inch baking sheets with parchment paper or silicone baking mats. Drop dough by the rounded tablespoons (using either a cookie scoop or two spoons) onto prepared baking sheets, spacing them about 2-inches apart. 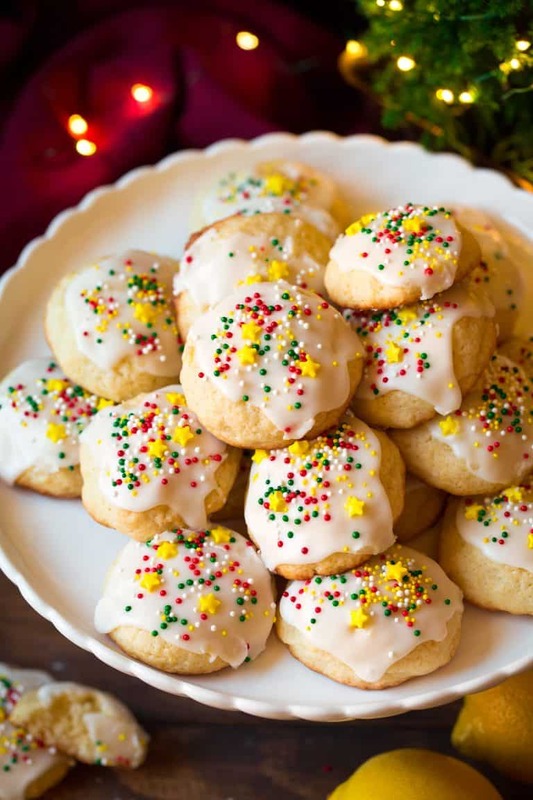 Bake both sheets in preheated oven, switching and rotating them halfway through baking, until bottom edges are golden and cookies are set, about 14 – 15 minutes. Cool on baking sheet several minutes then transfer to a wire rack to finish cooling. Set a baking sheet underneath cookies on rack, then spoon and spread glaze over cooled cookies and let glaze set at room temperature. Store cookies in an airtight container. For the glaze, in a mixing bowl blend together cream cheese and lemon juice. Mix in powdered sugar stirring until smooth.